20th Century Ships Introduction to the Largest and Fastest ship of the 20th Century. The introduction of steam engines to ships in the early 1800s began a new era in shipbuilding. The earliest steam ships used reciprocating piston engines. These engines required coal-fired boilers; steam from the boilers powered the pistons, the pistons turned a crankshaft, which in turn drove paddles or propellers. Steam turbines began replacing reciprocating engines during the firsts few years of the 1900s.With turbines having fewer vibrations, they soon proved to be more reliable and powerful. Steam turbines work like a modern day jet engine. They have a barrel casing with a shaft through the center. Attached to the shaft are rows of angled blades that are designed to turn in one direction. Pressured steam is forced through the barrel to turn the blades and shaft. Shaft and blades from a small turbine. Ship builders soon recognized that turbines worked better at high speeds and propellers at slower speeds. To solve this problem, many ships were fitted with gears between their turbines and propellers. As turbines can only turn in one direction, ships had to be fitted with smaller turbines to be used for reversing. The largest steamships had up to 29 coal-fired boilers. Early in the 20th Century, many steamships had their boilers converted to oil burning; this greatly reduced the amount of crew required to work in the boiler rooms. The first ship to cross the Atlantic using steam power was the full rigged sailing ship Savannah in 1819. This ship had been fitted with steam engines and paddle wheels for the crossing. With the combined use of her sails and paddle wheels, she took 29 days 11 hours to cross the Atlantic. The first crossings by steam power alone took place in 1838. At that time, two British companies sent rival paddle ships on the crossing within days of each other. Sirius left first taking 19 days to cross to New York. Great Western left four days later and arrived in New York only hours after Sirius. The first large iron ship to cross the Atlantic driven by a propeller was Great Britain in 1845. By 1859, an extraordinarily large ship named Great Eastern had been built on the River Thames/London. This ship was 692 feet long, 120 feet wide and 18,915 gross registered tons. The designer of Great Eastern ‘Isambard Kingdom Brunel’ worked for the Great Western Railway Co. This influential engineer rose to fame by designing Britain’s largest iron railway bridges. Brunel became involved in shipbuilding after the Great Western Railway Co began operating steamships. Great Eastern’s size had been calculated in two ways. She had to be large enough to carry sufficient supplies to complete the journey from Britain, around the Cape of Good Hope and on to Australia without stopping. Also, after the length of waves and distances between waves had been measured, Brunel believed a ship larger than these measurements would not roll and cause seasickness. After Great Eastern entered service in 1859, his theory was soon proven incorrect as she rolled badly in heavy seas. With this great ship struggling to run at a profit, no other company would build a ship to challenge her size until the end of the century. The first Trans Atlantic ship built from steel was Cunard’s merchant cruiser Servia. Built in 1881, she could cross the Atlantic in 7 days. The first steamship to be fitted with twin propellers was the liner Philadelphia. Built in Glasgow/Scotland, Philadelphia entered service in 1888. Ships at that time where competing to cross the Atlantic in the fastest time, as every liner that set a new record would receive worldwide press coverage, this creating publicity for the company that money could not buy. Beginning in the 1860s, the liner with the fastest Atlantic crossing could fly a Blue Riband from its topmast. By 1933, Sir Harold Hales had introduced a trophy for the fastest Atlantic crossing. 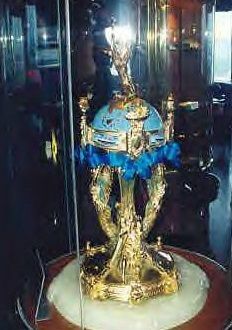 The trophy, still referred to as the Blue Riband, continues to be competed for until this day. Nearing the end of the 1800s, the German shipping companies Hamburg Amerika Line based in Hamburg and the Bremen based North German Lloyd Line were by far the largest shipping companies in the world. They had built Trans Atlantic liners by that time capable of competing against the British companies based at Liverpool, the Cunard and White Star lines. These two British companies specialized in Trans Atlantic liners and until that time, had taken the bulk of the emigration trade between Europe and America. The North German Lloyd Line’s Kaiser Wilhelm Der Grosse entered service in1897. At 648 feet long and 14,349 tons, she was larger than all the British ships on the Atlantic run at that time. With her two four-cylinder triple expansion piston engines and twin propellers, she soon took the Blue Riband from Cunard's Campania and Lucania. As Kaiser Wilhelm Der Grosse was capable of averaging over 20 knots on her Atlantic crossings, she could steam from Germany to America in less than six days. The Hamburg Amerika Line’s Deutschland a virtual look alike of Kaiser Wilhelm Der Grosse entered service in 1900. This ship soon captured the Blue Riband and held the title in both directions over the following few years. With these German liners receiving vast amounts of publicity, they showed the world that Germany was growing in wealth and industrial might. The British Government and its shipping companies had viewed the situation as totally unacceptable. This led to them subsidizing the building of larger ships, primarily just to outdo Germany. Shipbuilding at that time was seen by many as how well advanced and wealthy a country was by building the largest and fastest ships. Shipping companies in France and Italy soon began receiving government subsidies as well so they could join the race to build record-breaking liners. Although America resisted being drawn into building record-breaking ships for some time, they eventually found the prestige too great to ignore and built the fastest liner ever in 1951, named the SS United States. These Trans Atlantic liners were used for carrying passengers and a small amount of cargo, normally mail. British ships were given the initials RMS, standing for Royal Mail Ship. Other countries used the initials SS, standing for Steam Ship or Ship of State. Ships fitted with diesel engines were either named MV, standing for Motor Vessel or MS, standing for Motor Ship. Some countries naval vessels are given initials such as British warships being named HMS, standing for His/Her Majesty’s Ship. American warships are known as USS, standing for United States Ship. German warship names during the First World War era were prefixed by SMS, standing for Seine Majistat Schiff (His Majesty’s Ship). German ships after that time, as well as French, Italian, Soviet and Japanese were not known to use initials before their ships names. Warships can have numbers following their names to describe the type of ship and how many have been built for that navy. Such as a ship built for the US Navy with the hull number (BB.10) would be the tenth battleship built for that navy. Aircraft carriers have many different variations such in US ships CV stands for standard carrier, CVA attack carrier and CVN nuclear carriers. There are many variations of initials to describe the numerous classes of navy ships throughout the world, most of which need a fair amount of imagination to work out. Each ship has to be registered in size as harbor duties are set by the ships bulk. The measurement normally used for ships is Gross Registered Tons. This is a volumetric measurement that is worked out on the basis that, 100 cubic feet is the equivalent to one Gross Registered Ton. Warships are normally registered under Displacement Tonnage. This is calculated by the weight of water displaced by the ship after completion. Each warship normally has three different weights, light, standard and full load. Unless stated otherwise, the ships weight should be taken as standard. Crude oil tankers use GRT and Dead Weight Tons, DWT meaning the weight of water the ship displaces when fully loaded. Ships engine power can be worked out in 3 different ways, some countries use horsepower, some PS and some kilowatts. One horsepower is specified as a horse can deliver 33,000 foot-pounds per minute, equivalent to 0.746 kilowatts. PS is a metric measurement of horsepower normally used in Europe and Japan equal to 0.75 kilowatts. A ships speed is measured in knots, 1-knot meaning one nautical mile per hour. This is the equivalent to 1.15 miles per hour or 1.85 kilometers per hour, meaning a ship traveling at 30 knots would actually be traveling at 34 miles per hour or 55 kilometers per hour. Steamships became larger and faster at a time when the population of Europe had been outgrowing its economy. As a result, unemployment and poverty encouraged Europeans to immigrate to America. These steamships offered affordable travel to the new country, which at that time had no restrictions on immigrants. Before the emergence of steamships, less than 10,000 immigrants were entering America each year. The first successful Trans Atlantic steamship companies began operating from the port of Liverpool/England to various ports along the east coast of America. By the 1840s, 100s of thousands of British immigrants were traveling to America every year. After the potato famine in Ireland during the years 1845/1846, nearly two million Irish immigrants traveled to America over the following ten years. Next came the Germans and French. The French revolution in 1848 was caused by unemployment and poverty. That revolt escalated into Germany and did nothing to improve the political situation in either country. As a result, a mass migration from both countries began. As unemployment and poverty had begun spreading through the Italian population at that time, immigration from Italy to America began escalating in the 1870s. The first restrictions on immigrants were made in the 1860s, this only concerned Chinese as it had been claimed they were providing cheap labor for unscrupulous companies. The first act to put restrictions on European's was passed in 1875. From that time on, immigrants entering the United States had to be checked for a criminal record, serious disease, or if they had any radical political views. 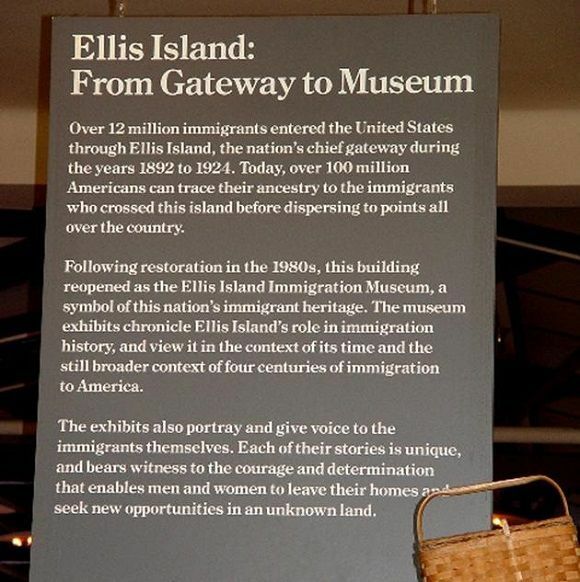 For that purpose, the immigration station at Ellis Island/New York was opened in 1892. From then on, the bulk of immigrants entering the United States passed through Ellis Island as seen below. Immigration to the United States continued in that manner until tighter restrictions were made in the 1920s. By then, each country had been allocated a specific amount of people allowed US citizenship each year.